Turkish Meat Pies with Arabic spice mix, mint and pine nuts. Amazing flavors and so delicious. Plus a bonus recipe for the Arabic spice mix. I remember a few years ago when I worked in Michigan, my Turkish friend and I went to a bakery. I don’t remember if that bakery was Turkish or Lebanese but we bought the most delicious meat pies there. That was the first time I tried these flat, open face meat pies and I was hooked. I remember I bought a few and brought them home and my husband and I fought over them. They were just delicious and they had beautiful Arabic spices flavor. I was determined to learn to make these myself. My friend told me the basic ingredients in them, and I just had to try and make them. These Arabic spices like cardamom, coriander and cumin were not really familiar to me, as Romanian cuisine is pretty basic and we don’t use that many spices. Although the spices were not too common in my cooking, I had all the spices in my kitchen. I love to buy spices from all over the world, because you never know when you’re going to need them. I enjoy going to Indian stores and Arabic stores and buy the different spices they have and then research and see what I can make with them. Ever since then I’ve been making these meat pies, not very often, but when I do make them they are gone in no time. 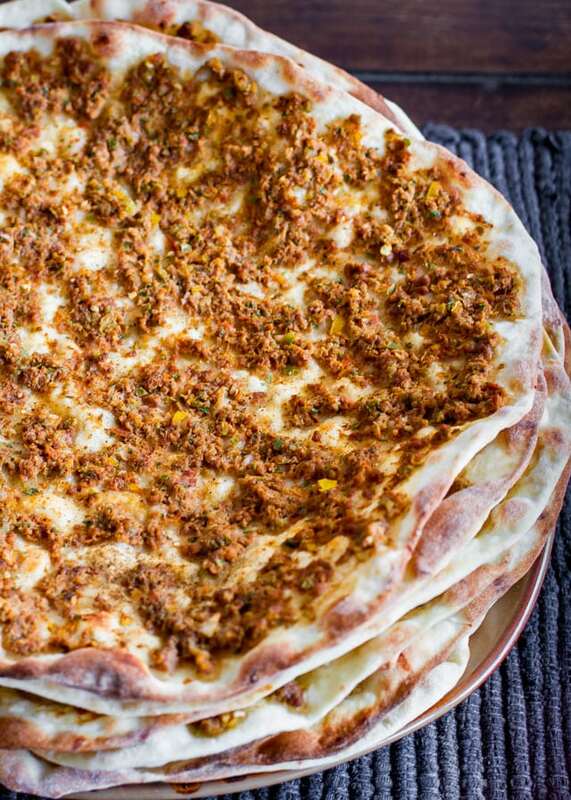 To make these meat pies, you’ll first need to make the Arabic 7 spice mix, if you don’t already have it. The recipe for the spices will make a lot more than you need for these meat pies, so just store them and use them next time. Now I’m not sure if these meat pies are a traditional Turkish recipe, but it’s what I’ve come up with from my friend’s recipe and my research for the perfect meat pie. They are easy to make, and first you need to make the dough because it needs to stay in the fridge for a couple hours. The dough is simple, but the special ingredient in this dough is the yogurt which makes it so light and delicious as well. The dough will be a fairly soft dough, and you need to place it in an oiled bowl and also rub some olive oil over the dough as well before you refrigerate it. While the dough is in the fridge you can make the spice mix and the meat mixture. The onion and garlic need to be chopped really small, so if you’re not that good with the knife use a food processor. Heat a tablespoon of olive oil in a skillet and add the onion, garlic and ground beef. Saute a bit and then add the spice mix, sugar, salt, and tomato paste. Cook until the meat is cooked through, about 5 minutes. Add the mint and yogurt and stir well. Place the meat mixture in a bowl and let it cool. 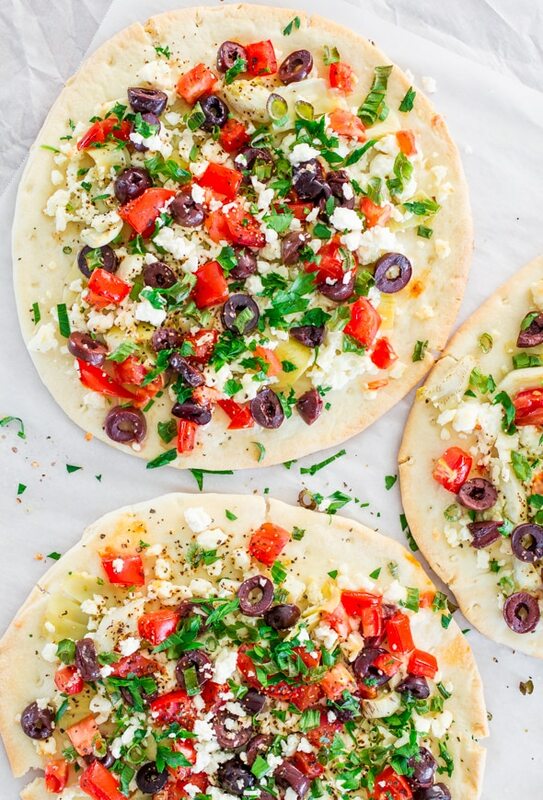 Take the dough out of the fridge and cut it into 12 pieces. Roll each piece into a ball. Take each ball and roll it out, do no use extra flour, use olive oil to stretch the dough as needed. The meat pies should be about 3 to 4 inches in diameter. If you use a cookie sheet you’ll be able to fit about 6 pies on it. Spoon a couple tablespoonfuls of the meat mixture over the rolled out dough and spread it evenly. Sprinkle some pine nuts over the meat. Bake them in a 400 F degree preheated oven for about 15 minutes. Sprinkle with some mint before serving. They are so cute and oh boy are they ever delicious. I love these meat pies! The Arabic spice mix gives these meat pies such an awesome flavor, it will be a party in your mouth. Here’s the printable recipe, don’t let the number of ingredients scare you away, it’s pretty simple to make. In a small bowl get the yeast going by mixing it with the warm water and sugar. Let it sit until it bubbles.In the bowl of your mixer, add the flour and salt and mix it well. Add the yogurt to the flour, the yeast mixture and the olive oil. Using the paddle attachment mix well. The dough should be soft. Place the dough in an oiled bowl and rub some additional olive oil over the dough, cover the bowl with plastic wrap and refrigerate it for a couple hours. While the dough is refrigerating mix all the spices for the Arabic spice mix together. In a skillet heat the tablespoon of olive oil and add the ground beef and finely chopped onion and garlic. Stir well and cook for a couple minutes, after which add a tablespoon of the spice mix, the tomato paste, sugar and mix. Cook for a couple more minutes till the meat is cooked through. Add the mint, yogurt and salt to the meat mixture and mix well. Let it cool. Take the dough out of the fridge and cut it into 12 pieces. Roll each piece into a ball. Take each ball and roll it out, do no use extra flour, use olive oil to stretch the dough as needed. The meat pies should be about 3 to 4 inches in diameter. If you use a cookie sheet you'll be able to fit about 6 pies on it. Spoon a couple tablespoonfuls of the meat mixture over the rolled out dough and spread it evenly. Sprinkle some pine nuts over the meat. Bake the pies for about 15 minutes. Sprinkle with some mint before serving. These were delicious. I made them as meat pies. I know they can be cooked and reheated but I love the freshness of just baked pies so I would like to assemble and freeze uncooked. How can they be baked? Bake directly from freezer or thaw first and bake? Thanks very much! I would thaw them out before cooking. You can probably freeze the dough separately and thaw out the dough first, then shape it and assemble the pies. I had a roommate in college and her fiancé was turkish. They made me something similar (35 years ago) and I am going to try these tonight, but they used ground lamb to I am trying that, the one question I have is do you use coriander seed or ground coriander for the spice mix? Thanks for the recipe! I used ground coriander. Hope you like it! Really love this recipe!! I made 2 batches last night on my dust try and they came out great! My husband ate 3 of them in one sitting. I’ve never been successful with making AND baking dough but these came out perfect. Thank you so much for putting together this wonderful recipe. P.S. Just an FYI, I think the printable instructions is missing the part about adding the salt to the meat. I meant “first try”. Not “dust try”. I sure wouldn’t eat dusty meat pies!!! I’d love to link this recipe to a blog post I’m doing on food. Could I use a photo and credit it to you as well? Would that be fine? I look forward to trying out the pies soon, they look amazingly delicious. Thanks for this recipe. My family used to devour these pies my Lebanese neighbor used to make for us, but she didn’t have a recipe, just did them of the bat, I’m pretty sure this is close to what she made. Will give it a try once I get the Arabic spices ingredients. Thanks again. Made these tonight…they were Super Delicious! Great recipe. The only modification I made was that I used refrigerated pizza dough because of time constraints. Turned out wonderful! Woow these look amazing, saw the blog yesterday and already making them, I’m waiting for the dough to rise and minced meat to cool. I also made a few changes such as I added 1cup of wholewheat flour and 1 and half cup plain flour, give it a heathier version, with the meat I blended together half green pepper, one green chilli, onion, half a tomato and little of mint, and allowd the excess water to drain out, I added that to the minced meat with the garlic and only one tbs of tomato paste and arabic spice. Turned out lovely and flavourful. Thanks for recipe, I’m sure ill be making it again! Glad you liked it, this really is one of my favorite recipes. I just love the flavor of these meat pies. This takes me back to my father’s cooking. These meat pies look scrumptious! I love all the flavors. I will have to give these a try. Thank you for sharing this recipe. These look so delicious–great photos! I love meat pies in any culture but have yet to try a turkish one! Can’t wait to make these–thanks for the recipe! So meaty. Must be a good meal which I should try. Looks really great and I bet its perfect served in the morning. I’ll try the recipe out, thanks for sharing. I love this specialty. Yours photos are mouthwatering! 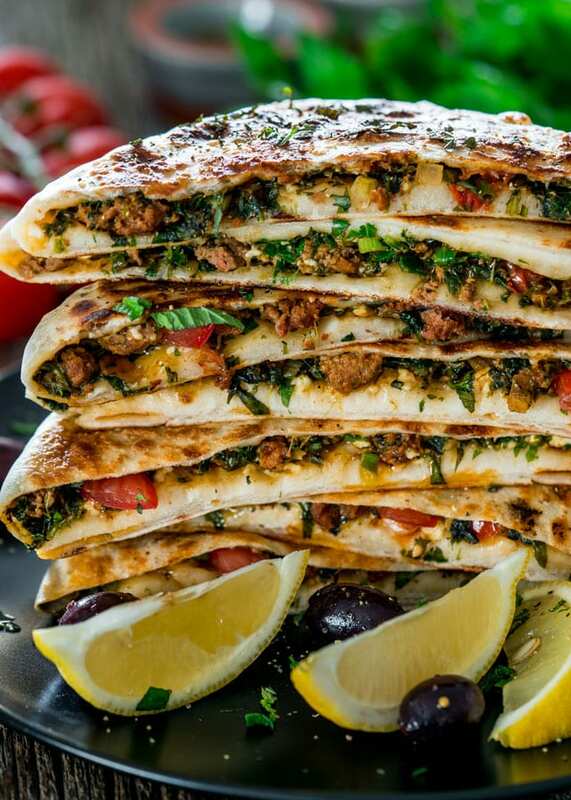 Super recipe – I have been looking for something akin to this in order to re-create something that my Turkish husband has described from his childhood – going to give the recipe a go tomorrow – thanks!